School Learning = f(time spent/time needed). Carroll defined time spent as a function of (i.e., resulting from or composed of) opportunity and perseverance. The measure he proposed for opportunity was allocated time or the amount of time the classroom teacher made available for school learning. The measure Carroll proposed for perseverance was engagement rate or the percentage of the allocated time that students were actually on task. Allocated time was multiplied by engagement rate to produce engaged time or time on task which is defined as the number of minutes per school day that students were actually engaged in school work. Carroll defined time needed as a function of aptitude, ability to understand instruction, and quality of instruction. By aptitude Carroll meant the ability to learn academic material. One measure of this variable would be IQ. By ability to understand instruction, Carroll meant the preparedness of the student for understanding the specific material to be learned. Bloom, a colleague of Carroll's at the University of Chicago, later proposed a measure of prerequisite knowledge as the best measure of ability to understand instruction. Carroll proposed a wide variety of instruction methods and techniques that he believed should be present in quality instruction. Later research identified a system of instruction labeled "direct instruction" as the best definition of quality instruction when the desired outcome is scores on standardized tests of basic skills. Carroll's model was the basis for a number of other attempts to identify and organize the primary variables associated with school learning. Keeping the concept that educators should focus on variables under their control, Squires, Huitt, & Segars (1981) proposed that both classroom- and school-level variables should be addressed. They adopted Carroll's student behavior variable of "Perseverance" and relabeled it "Involvement." However, they added Coverage (the overlap of content taught to content tested) and Success (the rate at which students were successful on assigned academic tasks). Carroll's teacher behavior variable of "Quality Instruction" was used as a subcategory within classroom processes and the subcategories of "Planning" and "Management" were added. While planning was not addressed by Carroll, management incorporates the variable "Opportunity" in that one aspect of Management is to use all available classroom time for instruction purposes. A significant addition in the Squires et al. model is the inclusion of school-level processes. These were classified in three categories: Supervision (direct interaction with teachers to improve classroom practice), School Climate (developing the ethos of the school), and Leadership (setting direction and maintaining focus on important issues). These and other variables were late incorporated in models of school learning developed by Proctor (1984) and Cruickshank (1985). Slavin (2006) took a different approach. His QAIT model redefines Carroll's variables in terms of teacher behavior, thereby focusing on the classroom teacher as the sole influence on school learning. Q stands for Quality of Instruction and is the same variable proposed by Carroll. A stands for Appropriate Levels of Instruction and redefines the student characteristic variables of Aptitude and Ability to Understand Instruction as a teacher behavior variable. These two variables are incorporated in the Instruction subcategory of the Squires et al. model. I stands for Incentive and is a redefinition of the student behavior variable of Perseverance into a teacher behavior variable. T stands for Time and is essentially equivalent to the Carroll variable of Opportunity. These two variables are incorporated in the Management subcategory in the Squires et al. model. The model of the teaching/learning process presented in this website is derived from these and other model's related historically to Carroll's model (McIlrath & Huitt, 1995). While Carroll proposed very specific variables related to school learning, which have since been equated with scores on standardized tests of basic skills, the systems or transactional model presented at this site focuses on categories of variables with the expectation that the selection of important outcome variables or what is meant by "school learning" will dramatically impact the selection of important context, input, and process variables. For example, if student optimism or social skills were selected as the most important outcome measures, the context, input, and output variables that would predict changes in these "school learning" variables would likely be different than those that would predict changes in scores on a standardized test of basic skills achievement. In addition, to omitting important variables related to teacher characteristics and classroom planning, there were important context variables that were not considered in Carroll's model. One reason Carroll omitted these variables was his intention to focus on those variables most directly related to school learning; the inclusion of family and community variables were considered by him to be "indirectly" related to school achievement. However, the changes in the global economy of the last 30 years and the need to focus on additional outcome measures beyond achievement in basic skills, point to the need to broaden the scope of important variables. Learning (Output) = f(Context, Input and Process). Output includes the specific measurement or measurements of learning (e.g., student achievement, social skills, cognitive development, etc.). Context includes the environmental or situational factors such as home environment and changing global conditions that influence the definition and measurement of important educational outcomes as well as levels of important input and process variables. Input includes the characteristics of teachers and students that they bring to the teaching/learning process. Process includes the thinking, feelings, commitments, and actions of teachers and students within the classroom or learning situation as well as the interaction patterns and descriptions of the learning environment that result from those interactions. 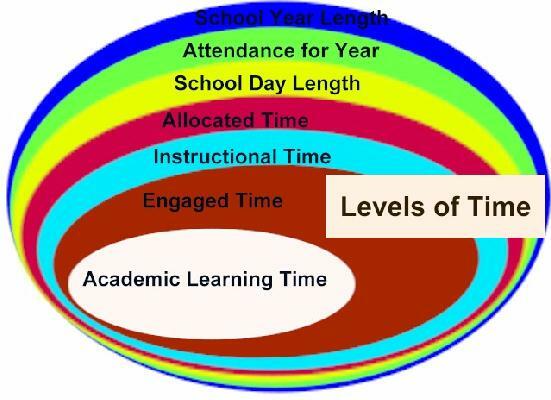 Academic Learning Time (ALT) is the variable that has replaced "time spent" or "engaged time" identified in Carroll's (1963) model. It is defined as "the amount of time students are successfully covering content that will be tested." ALT is a combination of three separate variables: content overlap, involvement, and success. Content overlap is defined as "the percentage of the content covered on the test actually covered by students in the classroom" (Brady et al., 1977; Cooley & Leinhart, 1980) and is sometimes referred to as Time-on-Target (Squires, Huitt & Segars, 1983). Involvement is the "amount of time students are actively involved in the learning process" and is often referred to as Time-on-Task (Stallings & Kaskowitz, 1974). Success is defined as the "extent to which students accurately complete the assignments they have been given" (Fisher et al., 1978). A high level of Academic Learning Time means that 1) students are covering important (tested/evaluated) content; 2) students are "on-task" most of the class period; and 3) students are successful on most the assignments they complete. Research has demonstrated that ALT is the most appropriate time variable on which to focus (e.g., Berliner, 1978). While changes in ALT are most directly impacted by the teacher's classroom performance in terms of planning, management, and instruction, it is ultimately the result of many decisions about how time is spent in schools and classrooms, as depicted in the graph below. Small increases in a number of these factors can lead to large increases in ALT. Berliner, D. (1978). Changing Academic Learning Time: Clinical interventions in four classrooms. San Francisco: Far West Laboratory for Educational Research and Development. Cooley, W. W., & Leinhardt, G. (1980). The instructional dimensions study. Educational Evaluation and Policy Analysis, 2, 7-26. Cruickshank, D. (1985). Profile of an effective teacher. Educational Horizons, 90-92. Proctor, C. (1984). Teacher expectations: A model for school improvement. The Elementary School Journal, 469-481. Slavin, R. (2006). Educational psychology: Theory and practice (8th ed.) [277-279]. Needham Heights, MA: Allyn and Bacon. (First edition published in 1986).